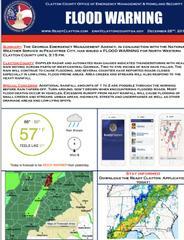 Summary: The Georgia Emergency Management Agency, in conjunction with the National Weather Service in Peachtree City, has issued a FLOOD WARNING for North Western Clayton County until 3:15 pm. Special Concerns: Additional rainfall amounts of 1 to 2 are possible through the morning before rain tapers off. Turn around, don't drown when encountering flooded roads. Most flood deaths occur in vehicles. Excessive runoff from heavy rainfall will cause flooding of small creeks and streams, urban areas, highways, streets and underpasses as well as other drainage areas and low-lying spots.